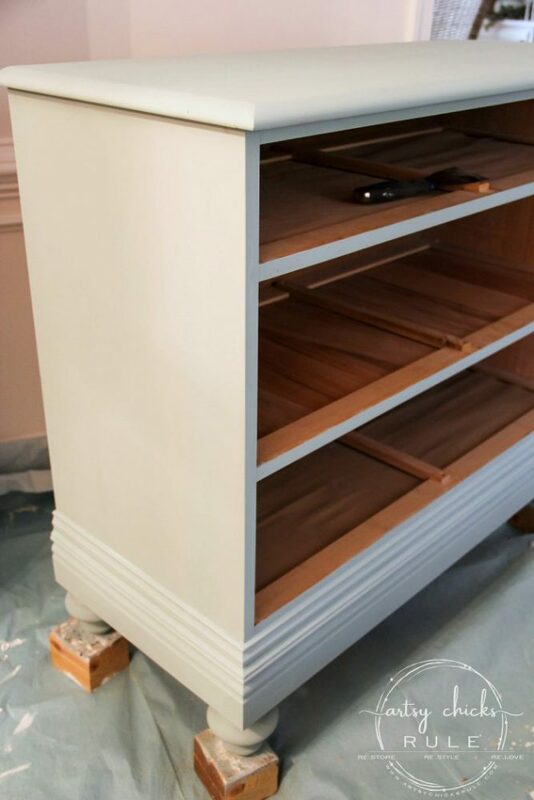 A dated dresser turned beauty with paint and a little modification! 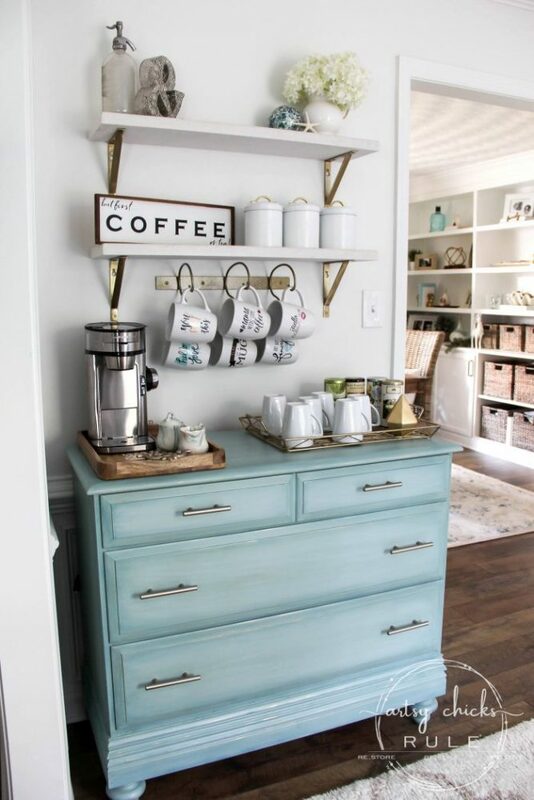 This aqua dresser is now used as a “coffee bar”. Friends….it’s time! Finally! 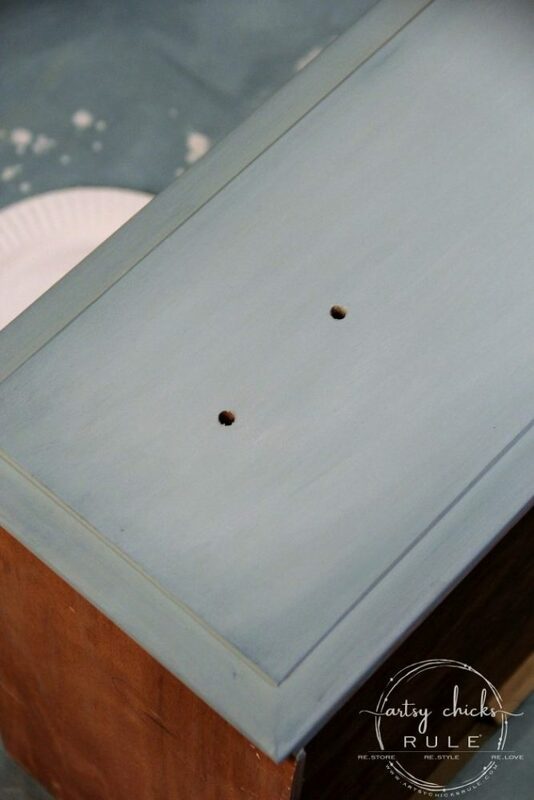 I’ve been teasing about and working on this little dresser for so long. Well, it’s done and I could not be happier. Let’s recap on this little beauty……remember these? 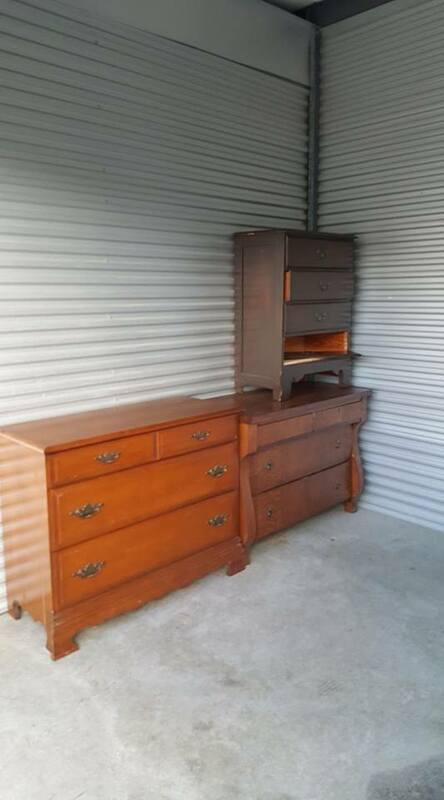 These are 3 dressers that a friend of mine, who was moving out of state, kindly gifted to me. We’re going to build a large shed but our home remodel took a few months longer than planned so that got put on the back burner. Hopefully soon then bye-bye storage units! 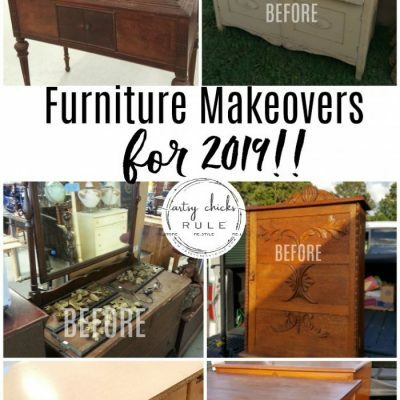 I’ve given 2 of those dressers makeovers so far. The one on the far top right (see it here) and today I’m sharing the one on the left. 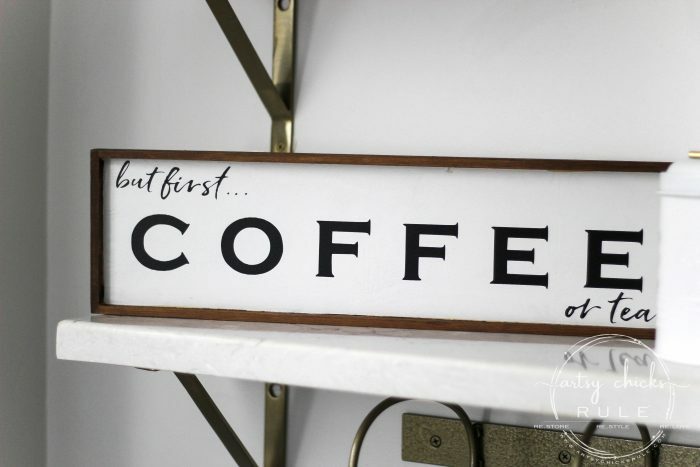 Remember that coffee sign I made awhile back?? 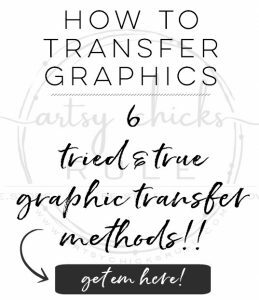 You can get all the details, and free printable, here. I’m really loving how it turned out even though I hadn’t planned to paint it like this originally. Originally I wanted it to be stained but that didn’t work out because of the modifications we made to it. 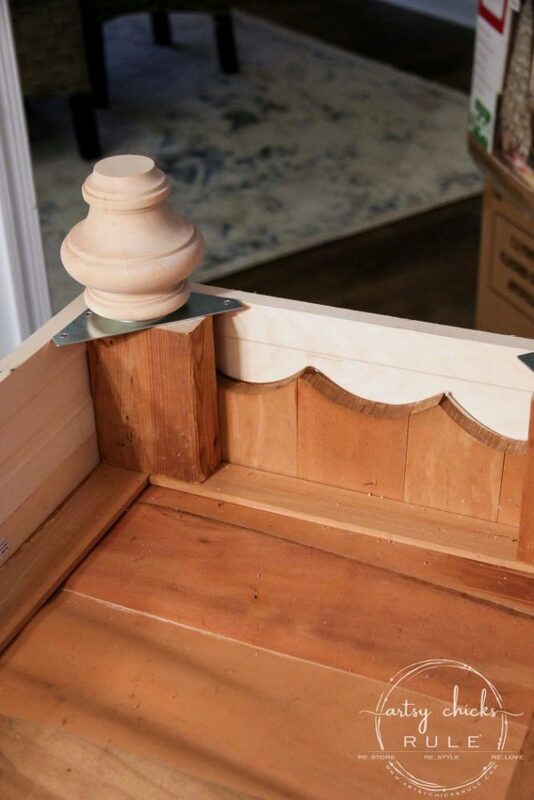 If you look closely at the bottom of the dresser in the “before” photo above, you will see the curvature of the bottom of the dresser. I didn’t want the dresser to look dated so I decided to change it up and modify it a bit. 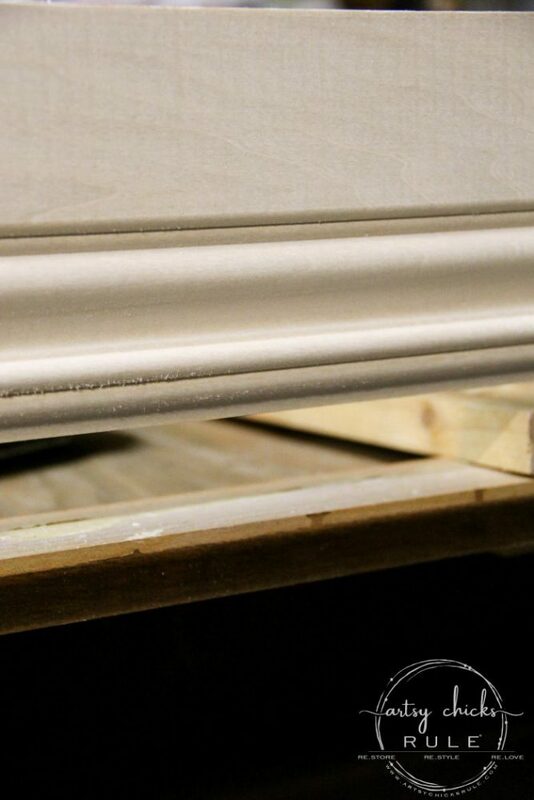 We pulled off the front trim piece….. 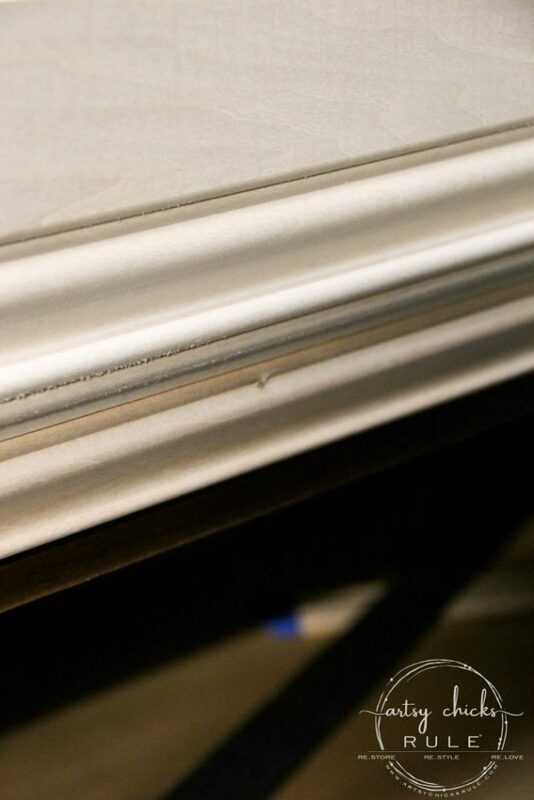 This is upside down but it’s the baseboard piece…. ….and above that is the small trim piece closing the gap…. 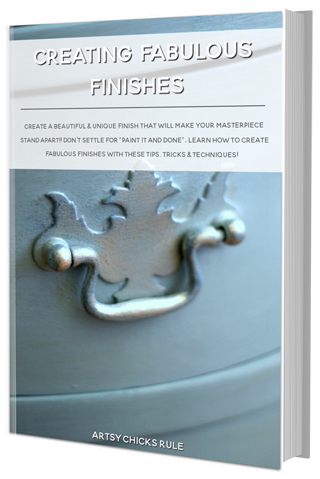 Which creates the look of one large piece of decorative trim. My husband cut and attached the wood support and feet for the aqua dresser. 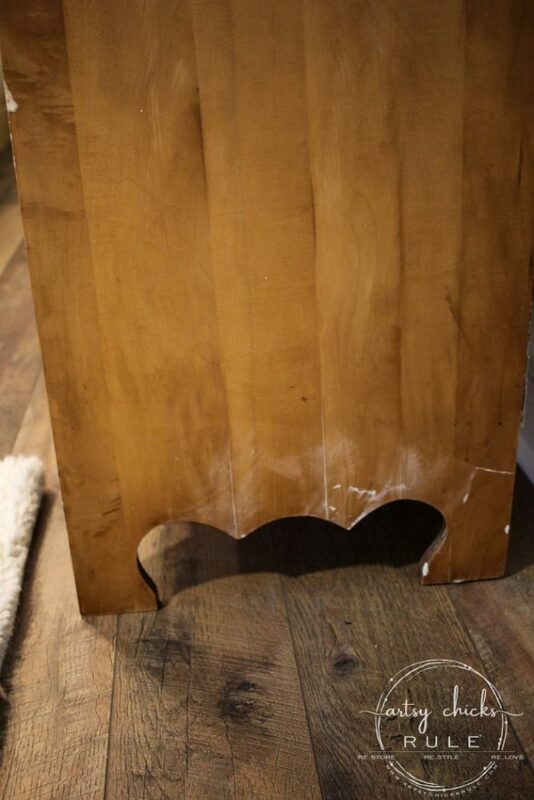 You can see here where he added a wood support, brackets and the feet. Also, notice how the new trim covers up the side cutout curves. 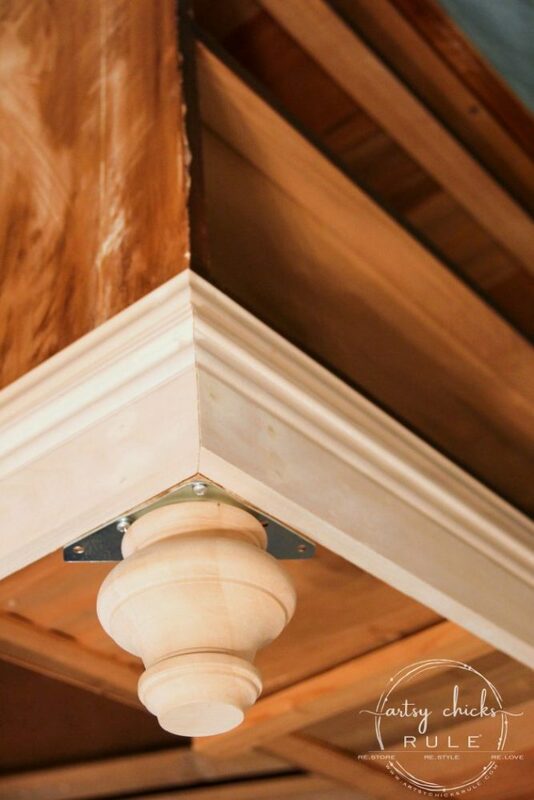 We didn’t end up using all the screws/holes for the brackets because it was plenty sturdy with just these. You can visualize it all better in this photo below. Isn’t that so much better??? 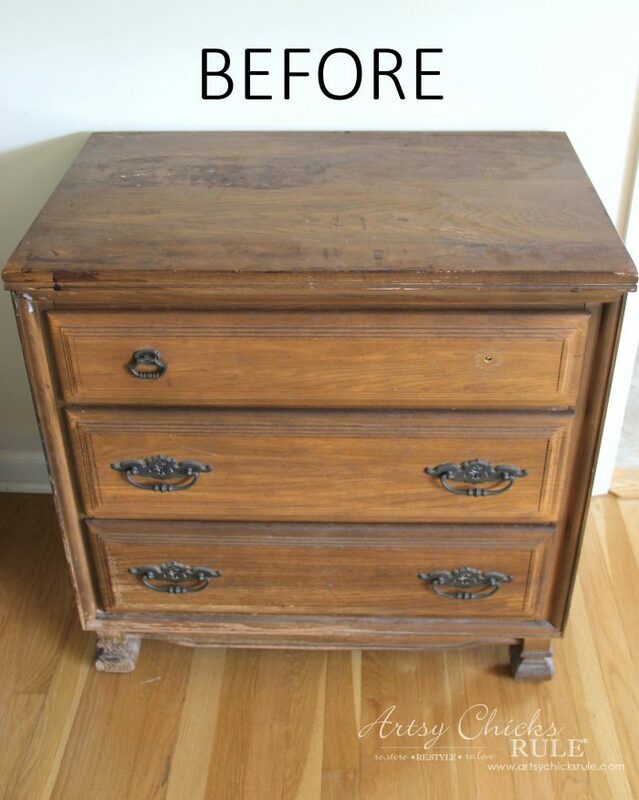 It gave the entire dresser a completely new look. This is the first coat of paint, by the way. 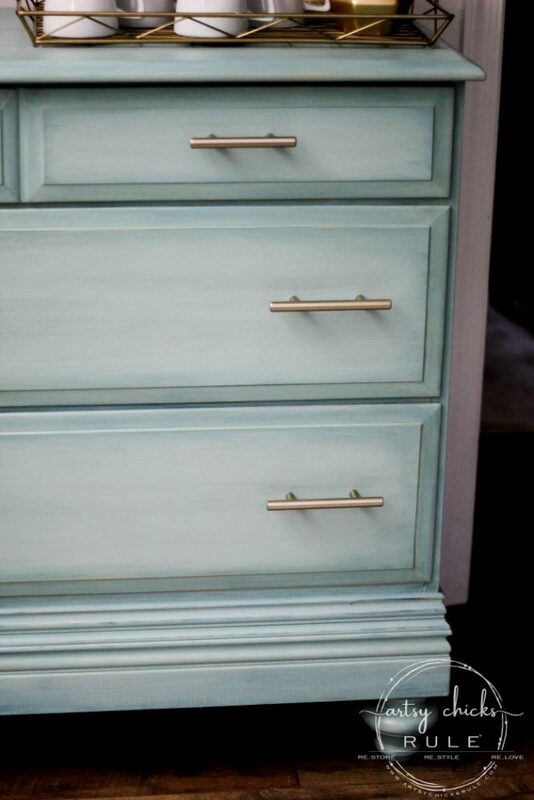 And it is definitely an aqua dresser even though it doesn’t look like it. The photo makes it look sort of white-ish, it’s not. 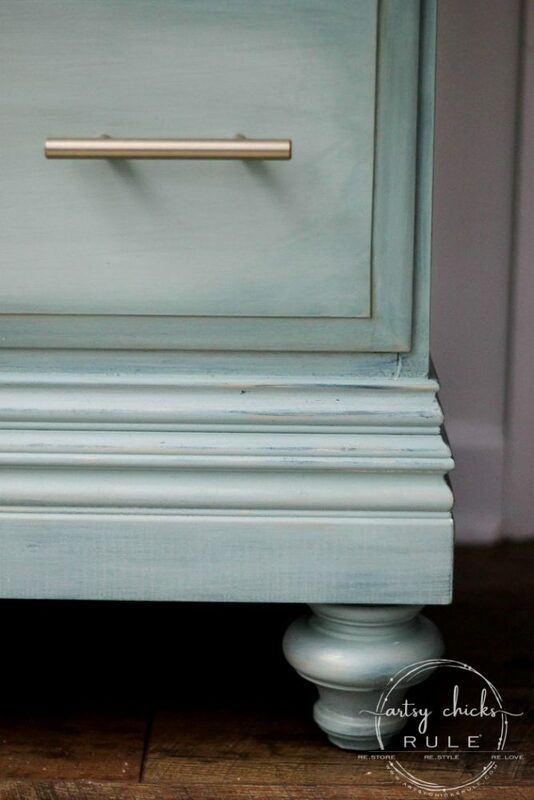 To get that lovely blue for my aqua dresser, I created the paint out of a blend of what I had on hand. I have no idea on measurements but here’s what I used. I’ll do my best at what I think I used as a starting point if you are interested in duplicating. I ended up only having to do one coat of this mixture. It’s really hard to see in the photos, sorry. But there is a very slight “wash” of white along the middle area. 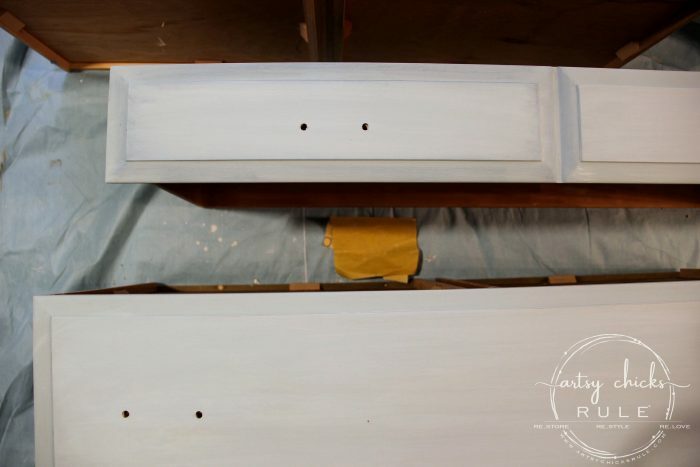 Next I used Aubusson Blue to darken the outer areas of the dresser. You can see both the white and blue around the perimeter better in these photos. 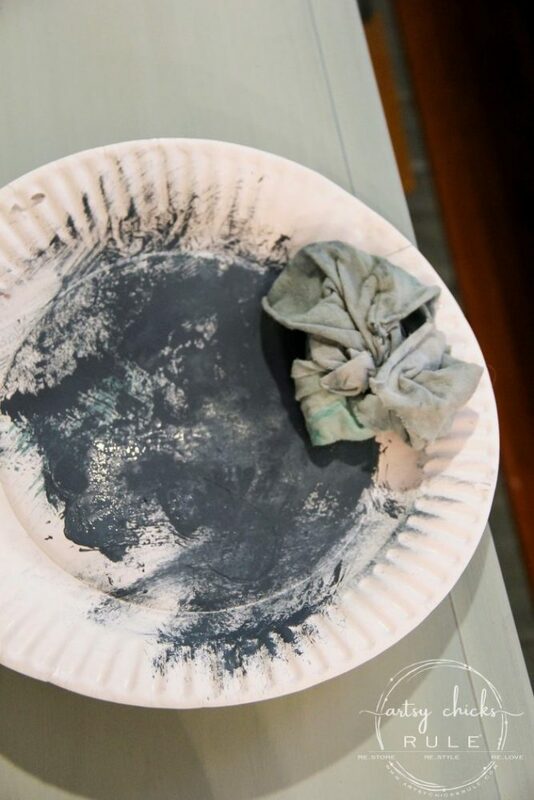 For the darker blue, I used another damp rag and dipped it into paint (undiluted) and wiped most of it away on a paper plate before applying to the dresser. The key here is a well dampened rag….and to blend. Wipe and blend. You can see here the dimension is gives. Even the feet got special treatment. 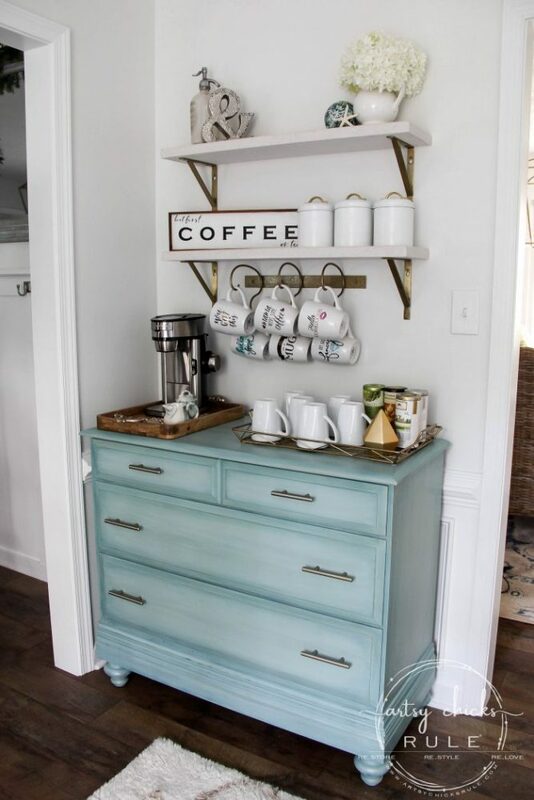 I wanted to add a bit of glam to my little aqua dresser. So I added a bit of gold paint to the edges. 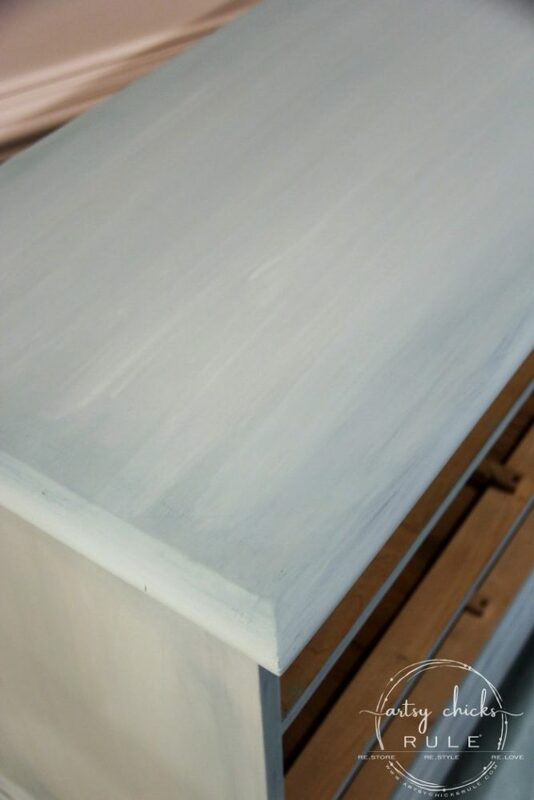 Just as you would distress the edges by taking paint away, I added paint on those same edges instead. You can see it better here…. Just a fun little hint when the light hits it right. The gold paint is just a little jar of gold, metallic paint. It is no longer made but any gold metallic craft paint would work. And in this photo you can see the darker blue shading pretty well. 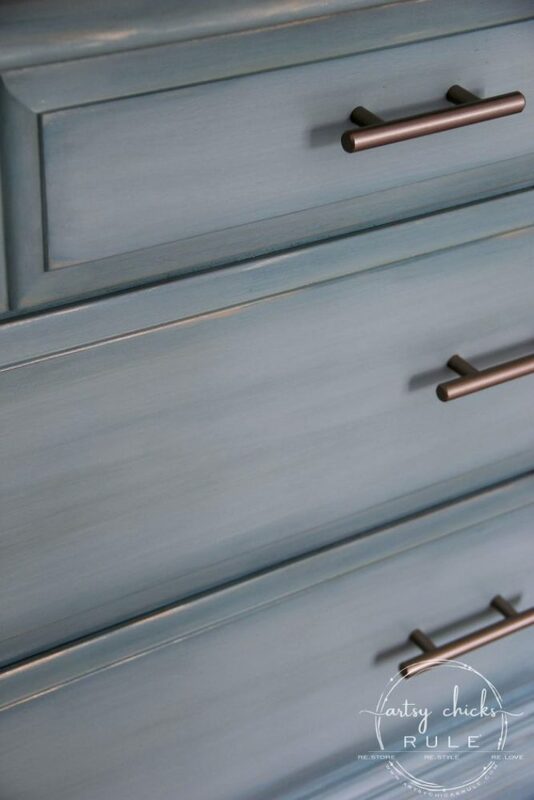 The entire dresser got sealed with high performance top coat, my all around favorite top coat. My little pretty got new pulls too. 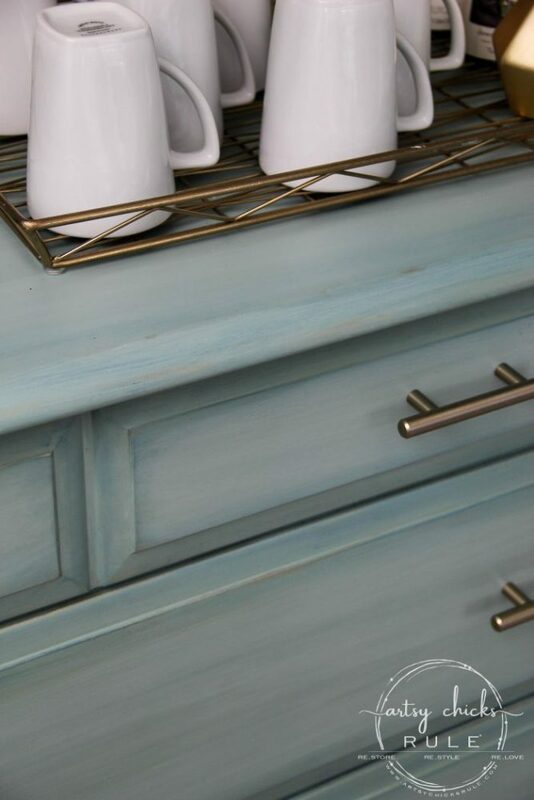 I used the same ones I have in my kitchen except I painted them so they’d have a hint of gold too. This is the gold paint I used on the pulls. 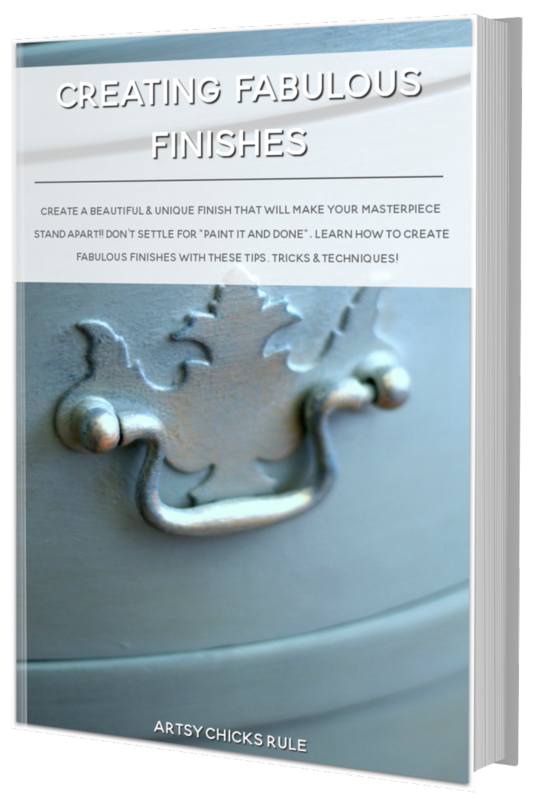 It’s a beautiful understated gold that I also used on this project. They look silver in some of the photos but I can assure you, they are gold and look gold in person. 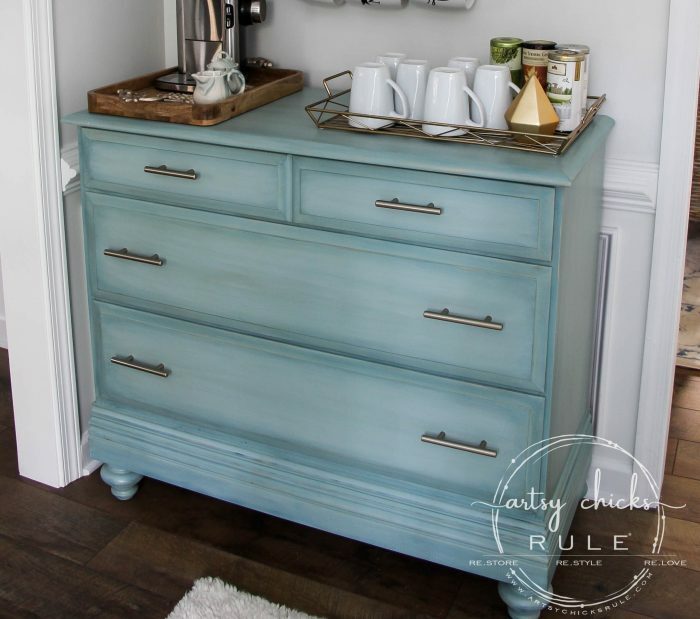 I love how the variations in paint color gives the dresser some character and keeps it from being just …flat. It’s very similar to my favorite secretary desk, just executed a little differently. The shelves were leftover quartz from our countertops. I just LOVE them! And love how it ties it into the adjacent kitchen. I got the pretty gold brackets here. Here’s a photo of it…. I didn’t think the pallet wood would really go so I simply did not use it when I put this back up. And up there on the top shelf in the middle….. I had this starfish platter…. …which I just loved!! I’ve had it for years. 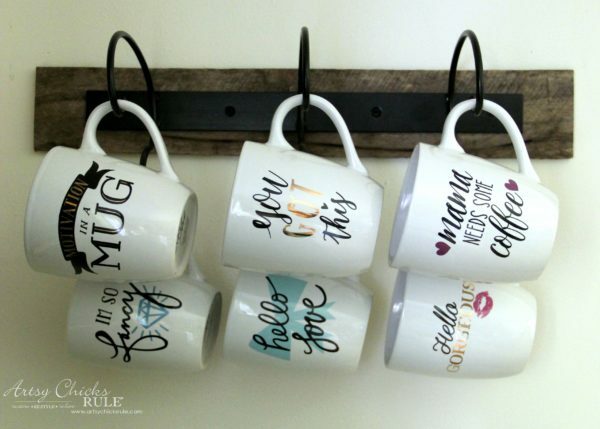 But…dummy me was hammering in a nail to start the screws for the coffee cup hanger and well….I guess I rattled it enough to make it fall… on my head and then it crashed to the floor into a million pieces. Thankfully it was not too far from my head so that wasn’t so bad…but it really shattered when it hit the floor. Too bad it didn’t fall to the right of me where there’s carpet. :( I was SO bummed and so sad. I really loved it and it looked great up there. I am still working on that so it will most definitely change. But that’s good for now. Well, for today because that’s coming down and Christmas is going up. hee hee I’ll be sharing all the rooms decorated for the holidays soon. 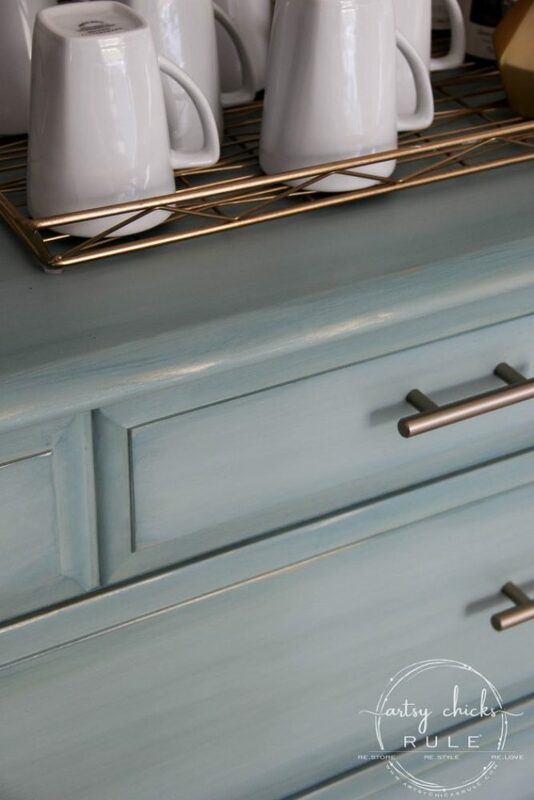 I loved the handles but the gray, not so much, so I sprayed them with white spray paint in satin finish. I found the wood tray there too. 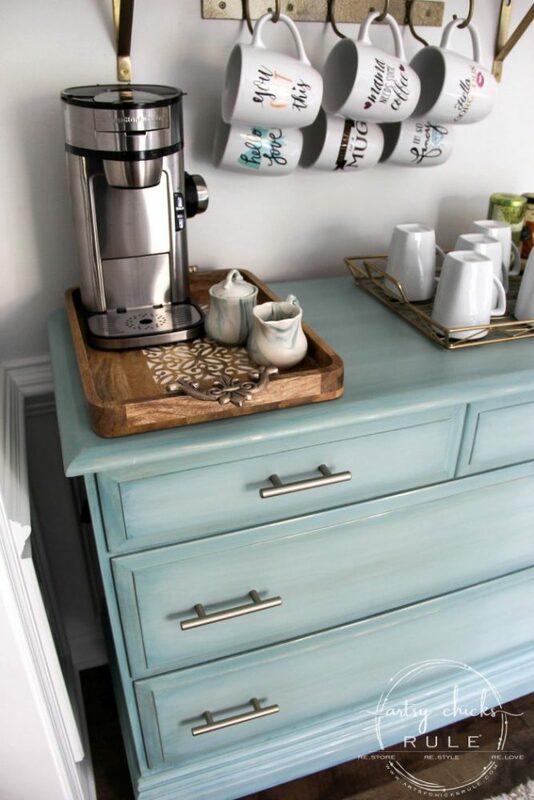 I wanted to put something under the coffee maker to protect the paint from splashes and spills. That is always bound to happen. 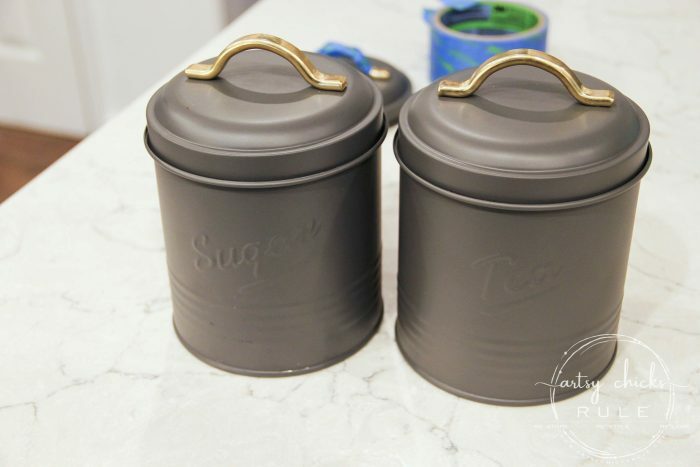 The little creamer and sugar set can be found here and here. I picked those up this morning too. They were cutie patooties and I couldn’t resist them…and they were cheap so they came home with me! 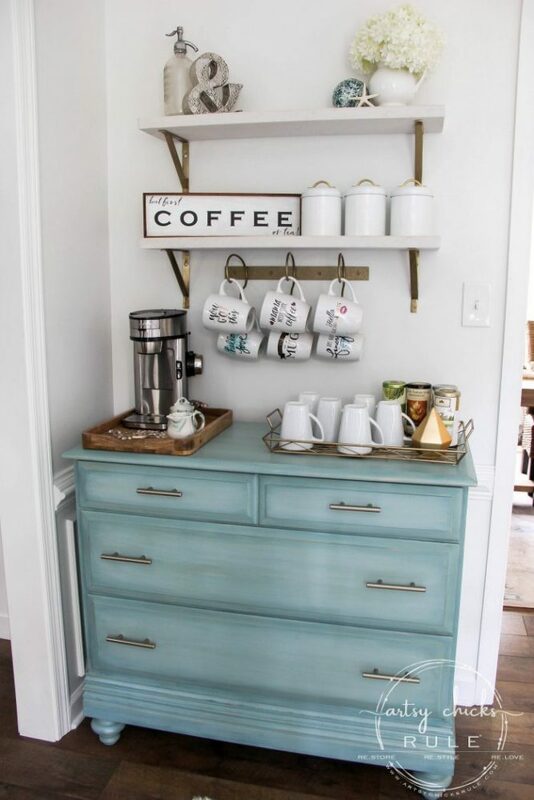 Anyway, I really love the wood tray and the wood is the same as the end tables in my morning room, so that’s a plus. The coffee maker is new-ish to us. I shared it and a link to it in my Instagram stories awhile back. 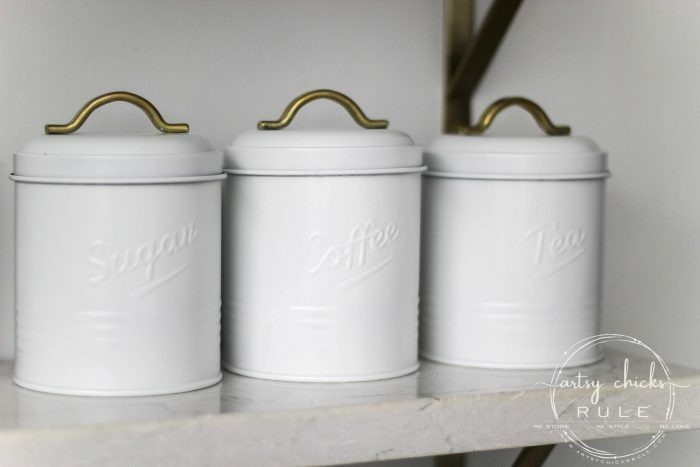 We never make a big pot of coffee anymore though. I don’t drink it often and even when we have guests, we’ve found that they would each make their own. So, we went single…it takes up less space and it’s even better than the other one! So fast and so hot. You can make your one cup in a jiffy. AND you can make your hot water for tea in a jiffy too! 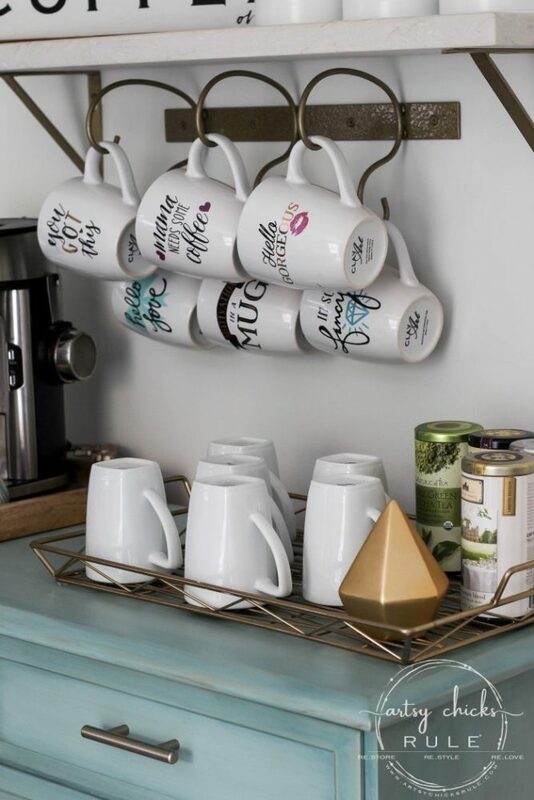 Perfect, love it…and it doesn’t break the bank either! Win!! You can find it, here. And the “so fast, so hot” thing has become a joke with my husband and myself. haha I texted him the first time I used it and told him how I couldn’t believe how fast it brewed and that it was so darn hot! lol I think I might have said it a few more times after that because he’s always teasing me saying, it’s fast…and hot, every time I make tea, etc. He’s soooo funny. 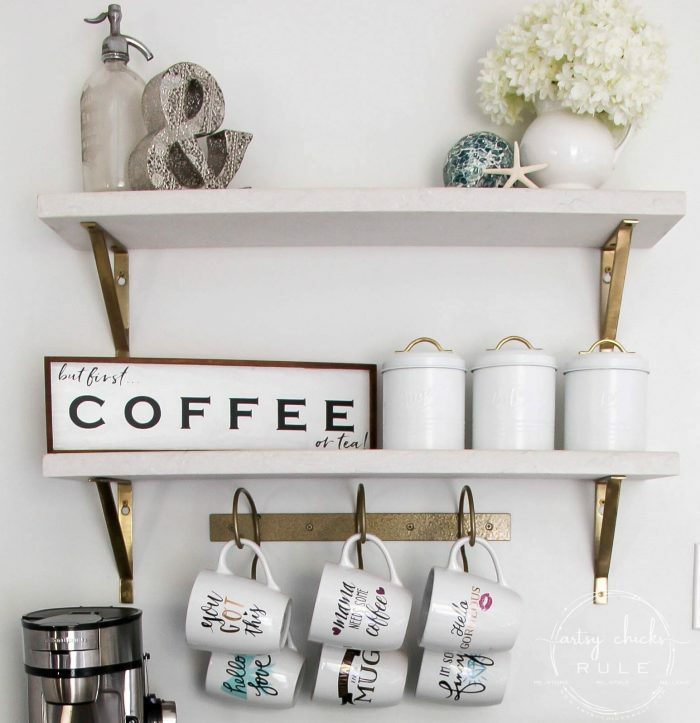 The white mugs are from Pottery Barn but I found them at the thrift store some years back. I couldn’t find them on their site but here is a link to a bunch of other white ones they now have. 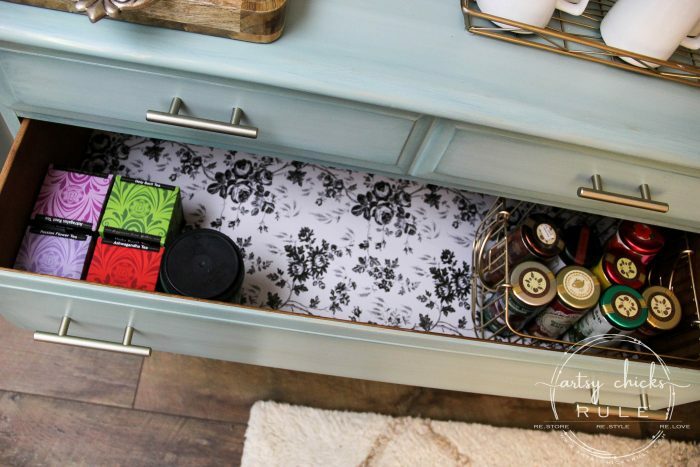 Want to see how I use the drawers inside my aqua dresser? 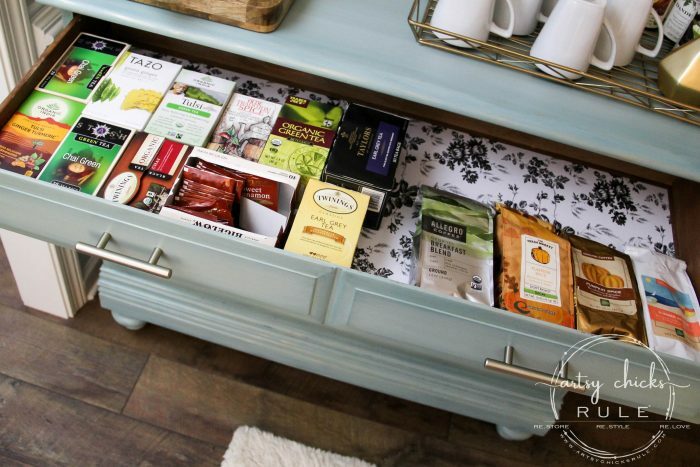 The bottom drawer is completely empty right now too! I simply lined them with shelf liner from the Dollar Store. Easy! I can’t believe how silver the hardware looks in some of the photos. BUT it was dark, raining and overcast all day here. So lots of camera settings (crazy slow shutter speeds) and editing magic going on in these photos. Anyway, I am quite sure that is part of the reason they look silver instead of gold. That and the fact that I used one of the softest, most understated gold spray paints out there. 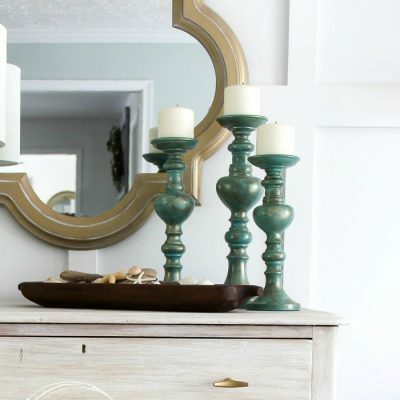 So tell me, what do you think of my aqua dresser?? Do you like the makeover I gave this one?? I’m really happy with it. Especially since I’m never quite sure (well, not never, but not always) what I’m going to do and IF it’s going to work out. I was fully prepared to have to repaint this with the base paint, if needed. Thankfully it was not! Yippee!! PIN to save it for later!! I’ll see you guys back here on Thursday with my new coastal dining room all decked out for the holidays! I am even trying to pull together a beautiful table setting on our new table. Hopefully I’ll be able to! I put up 3 trees this year. One of them is in the dining room. If you don’t follow along on Instagram, you’ve missed a few little snippets here and there. I shared on my account and in my stories too. The trees I shared on my stories are now gone (they only last 24 hours) but you can still catch the photos I posted to my account over there! 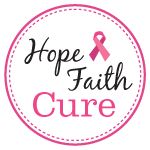 Then you don’t want to miss this post coming next month! 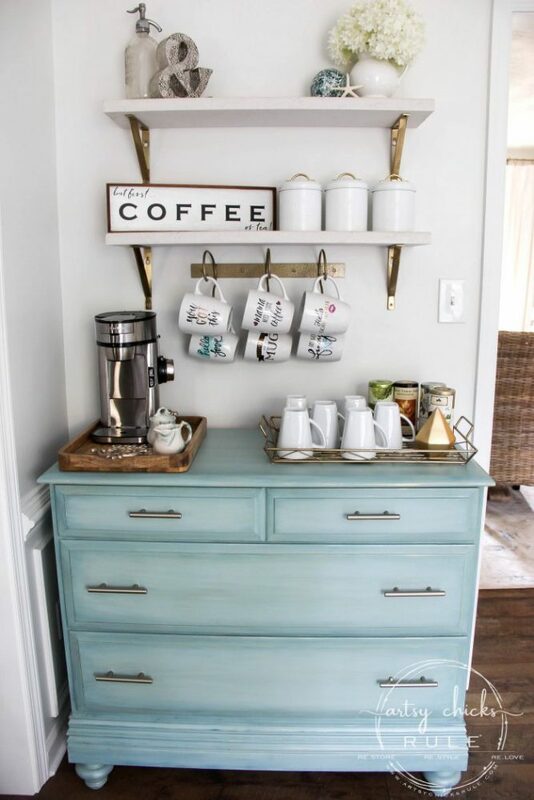 I absolutely love everything about your coffee/tea bar! 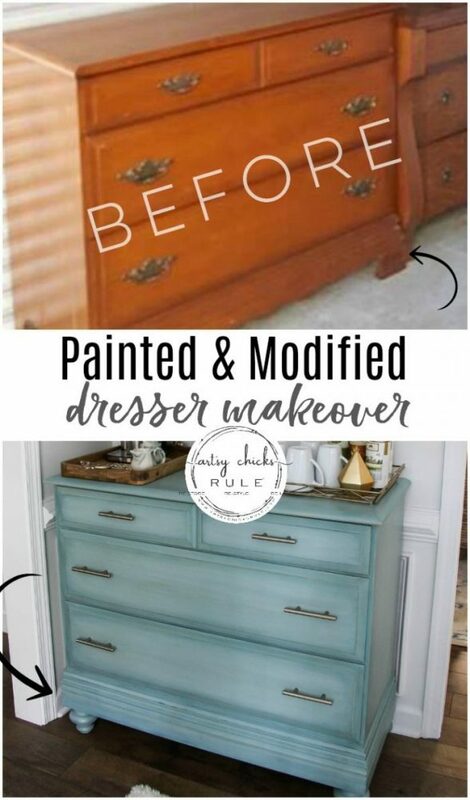 You did an amazing job painting the dresser and I really liked me how you trimmed it out to update it and added feet; I’m all about adding feet to furniture, for some reason I don’t like furniture sitting directly on the floor, lol ?. 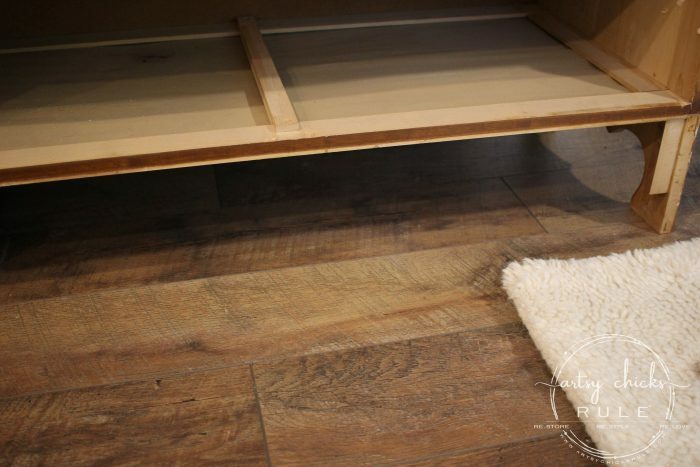 I think maybe its because I think it looks more open and airy that way and I can clean under it easier. 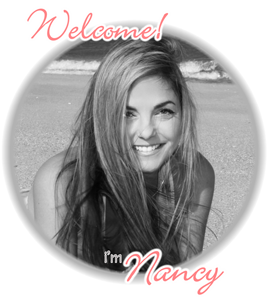 Your style is very different from mine, but I really enjoy your projects, and your home is beautiful! Super cute. 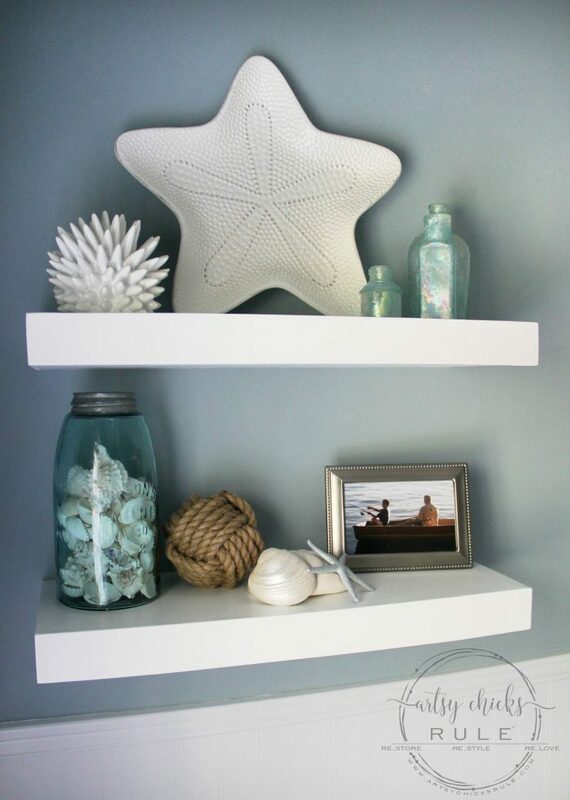 I love the idea of using baseboard trim on the bottom. Beautiful and fits perfectly in that location! Love it! Wow you did it again. 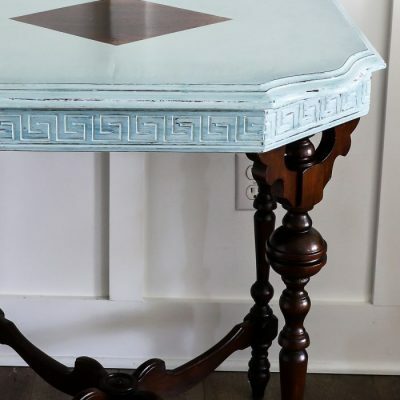 Love the color, the use of trim to cover the area you didn’t like too much, and the addition of the feet. Love your style too. I’m into “Coastal” too. Your posts give me inspiration every time. 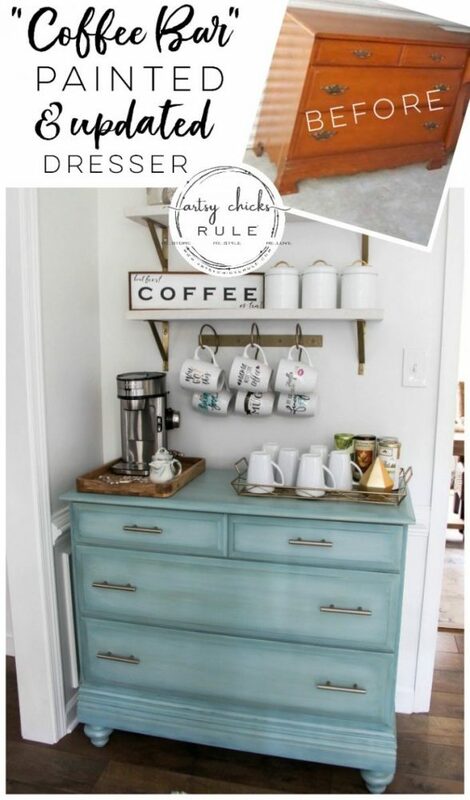 Love everything about the dresser….and the post! 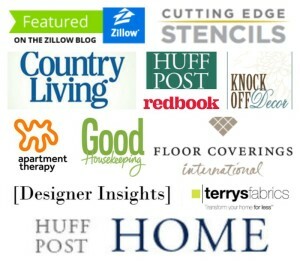 Thanks for the great info on how you did the blended colors and all the links to everything. I read the post through and then went back and reread and checked out all the links. It’s so pretty. What a difference the trim and feet make. I learn so much from your blog. Thanks again! Absolutely beautiful. 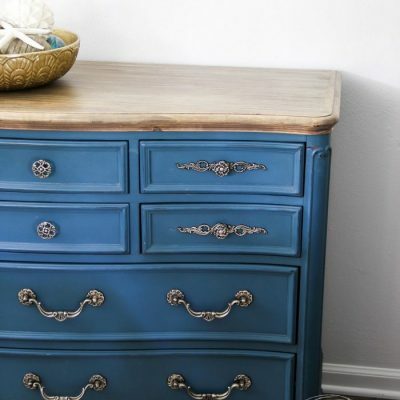 The modifications took it from a Plain Jane dresser to a beauty. 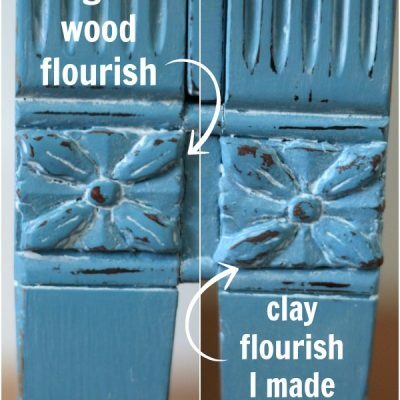 By adding the bottom moulding and feet, it also made the front look more defined. The paint texhniques you used added so much depth and dimension. 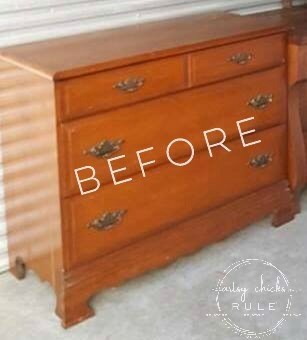 It’s amazing the difference you’ve made in this simple dresser. Astounding work! 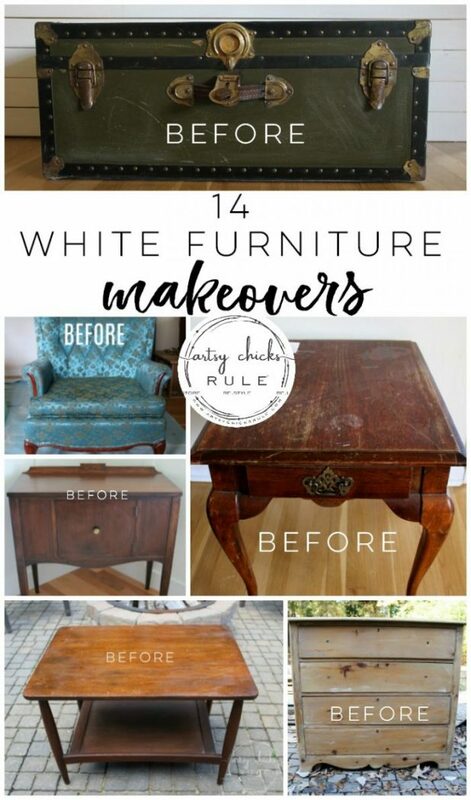 Thank you for sharing a step by step tutorial so that the brave amongst your followers can attempt to beautify our homes. 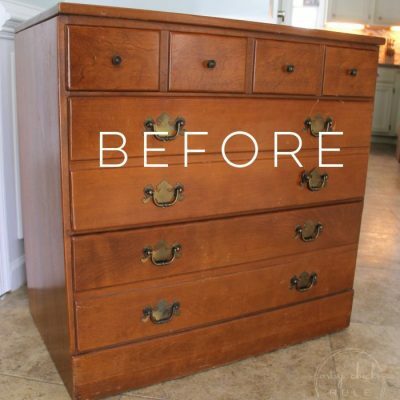 What a gorgeous change for this little dresser! 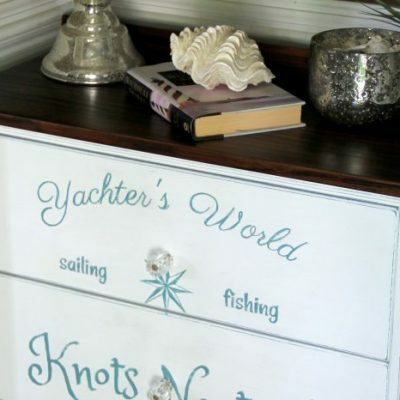 I love the additional trim on the bottom to hide the cutouts and those little bun feet! But girl, those soft perfect colors with that hint of gold just take this piece to the top! I love it! 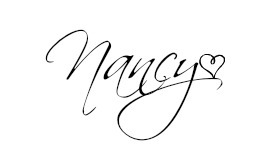 Oh Nancy, this is a stunning, stunning piece! Well done!